Liberty means freedom. Freedom is not about borders, passports, driving licenses, tax stubs and censuses. Freedom is not about race, ethnicity, religion, nationality, or one's economic worth. What is freedom if not the feeling of being free? What is freedom if not the pursuit of life and happiness? Recently I have been thinking about a sweet little children's book called The Statue of Liberty by Lucille Recht Penner. The author writes, "A lady stands in New York Harbor. She is as tall as a skyscraper. She is called the Statue of Liberty. "Liberty" means freedom. All over the world, people dreamed of coming to America to find freedom. People came by ship. The trip took many days. Men, women, and children were crowded together. They were tired, hungry, and scared. Suddenly they saw the lady! They had reached America at last. Now they knew they were free. People cried for joy. 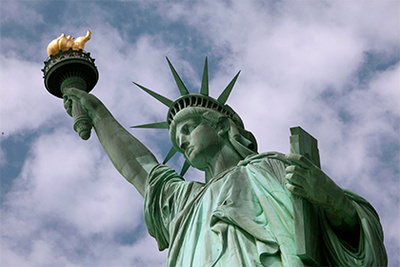 The Statue of Liberty was a present from the people of France to the people of the United States." It is a simple children's book, but often the most profound messages are encapsulated in the most unassuming forms. The question that this book asks all Americans to think about is why France gave us that statue in the first place. They did so because they admired what America could become. Much more grandly, France wanted that statue to represent the dawn of a new kind of opportunity. They wanted it to be a beacon of faith and hopefulness for all nations, and a permanent monument to the brotherhood and sisterhood of common people wherever they exist. In the words of Emma Lazarus, “Give me your tired, your poor, your huddled masses yearning to breathe free." Today, despite President Trump's confounding revision of history regarding his political stance on DACA, the fact remains that he alone is responsible for putting the program on life support. Moreover, from day one his administration has made it a priority to intimidate, belittle, undermine and harm immigrants, migrants and refugees. Rather than extending a hand to the tired, he has ripped it away and shoved them back. Rather than welcoming the poor and huddled masses yearning to be free, he has smeared them for their poverty and mocked their desire for a better life. From authorizing Gestapo like raids by U.S. Immigration and Customs Enforcement (ICE) to implementing unconstitutional travel bans on Muslim refugees, President Trump has shamelessly wreaked the American promise and forever tarnished the symbolic beauty of France's most treasured bequest to our country.